U. L. Labeled Fire Doors are rated closures for fire protection that prevent the passage of flame and smoke. 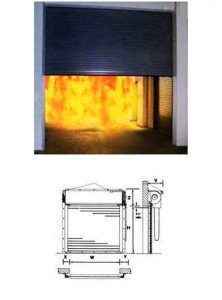 In case of fire, the fusible link releases the starting mechanism, and the door descends automatically at a controlled speed under governor control. Quality Fire Doors meet the requirements of building codes and insurance ratings that call for U.L.label rolling fire doors. 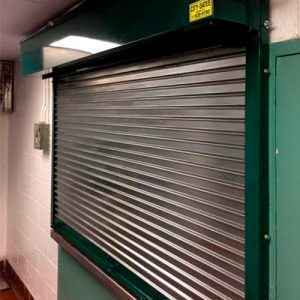 During normal usage, they can be operated as Service Doors; operation may be push-up, chain, or motor. LABEL AND CONSTRUCT DOORS -to conform with the requirements of the Underwriters’ Laboratories, Inc. 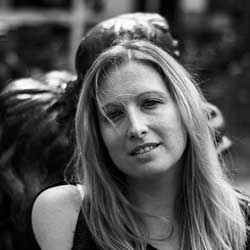 (U.L.). Doors to be automatic selfclosing, Class (A) (8)©(D) Label or Oversize Certificate. AUTOMATIC CLOSING -to be thermally controlled by release of the fusible link. 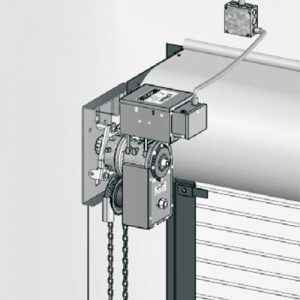 Astarting mechanism, using centrifugal force, is to cause the curtain to close by releasing the torque of the closing spring against the door shaft. OPERATION -to be (Push-up with handles) (Chain and reduction gears; maximum pull of 35 lbs.) (Motor-refer to options). CURTAINS – to be composed of interlocking slats of (galvanized steel) (stainless steel). Class A, B, or C Curtain Gauge as required with malleable iron endlocks as required by the U.L. Galvanized steel slats to be from hot-dipped strip, with 1.25 oz./sq. ft. zinc coating, and phosphate coated for paint adhesion. Bottom of curtain to have two reinforcing angles of (steel) (stainless steel). COUNTER BALANCE ASSEMBLY -to consist of tempered helical torsion springs with 25% safety factor, mounted on shaped cast anchors, supported by a continuous solid torsion rod. This mechanism to be permanently lubricated and enclosed within a steel pipe shaft. Deflection of shaft not to exceed .03″ per lin. ft. The spring tension adjusting wheel is to be readily accessible from outside the bracket plate. BRACKETS -to be not less than 1/4″ thick steel plate, to contain sealed self-aligning ball bearings for suspension of the counterbalance assembly. Brackets to be mounted to the structural wall angle to form a self-supporting member, and form an enclosure for the hood. Brackets to be reinforced with welded steel bands for support of hoods. Gears to be of high grade iron, cast from machine-cut patterns. 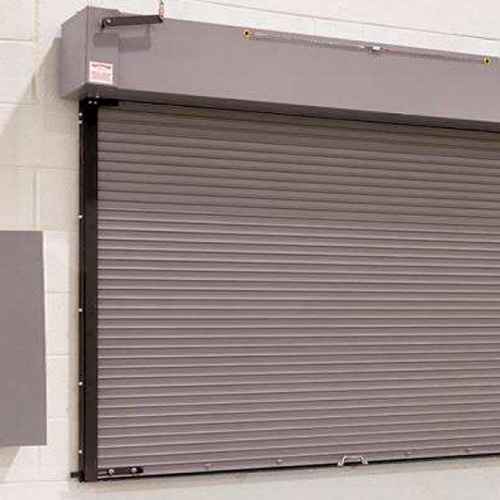 GUIDES – to be composed of structural (steel) (stainless steel) angles, minimum 3/16″ thick, with expansion slots at all connections, assembled with 3/8″ bolts, mounted to jambs at a spacing not more than 1’6″ on centers. HOODS -to be of (galvanized steel) (stainless steel), #24 Gauge minimum, stiffened top and bottom. FINISH ON STEEL -to be one shop coat of metal primer, except on galvanized surfaces. On stainless steel, finish to be 2B mill. Note: The American Rolling Door Institute support periodic inspection of all fire door assemblies. Note: Approved U.L. 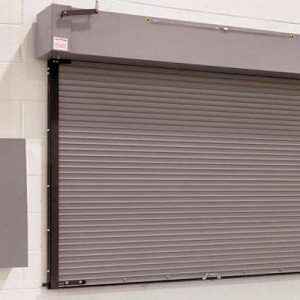 Fire Door construction does not permit the use of many options available on Service Doors, such as guide weatherstripping, pass doors, mullions, vision lites, aluminum, etc.